Welcome to the Velocette Owners Club - Woburn Centre website. The Velocette Owners Club is a club run for the sole benefit of owners of Velocette motorcycles and it has various local centres throughout Great Britain. The Woburn Centre is one of the centres that come under this umbrella. The Centre meets on a regular basis at The Cross Keys public house, High St, Cranfield, Beds. MK43 0JB. [Click here to see their lunch menu] Meetings are held on the first Sunday of each month (except winter breaks) at noon and the third Monday at 7.30 pm unless otherwise stated in the diary of events. Should you wish to join the club, please feel free to come along to a meeting or leave your details on our contact form and we'll show you what to do. Alternatively, you can contact the main club direct by clicking on the link below. We hope that you will enjoy looking at our site and that the information within it will be of assistance. 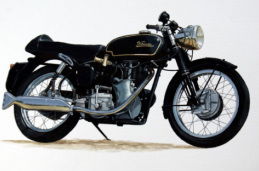 To visit the main Velocette Owners Club site click here.